"Sorry to bother you. I have a bit of a question to ask regarding stators. The seal behind my stator has broken and leaked a considerable amount of oil into the casing, would this be a cause for shorting out? I have yet to check with a multimeter (my one won't work! How convenient hey?) Just wondering if it's possible the oil is shorting out the charge circuit. The connectors to the wiring harness were very hot yesterday and I blew the main fuse. After unplugging everything bar the main connections on the harness and the servo motor it still blew." The stator on many motorcycles run in oil, so this shouldn’t actually be a problem. From your description, I would say that there is a chance that the regulator / rectifier is at fault, or perhaps the battery. Reading more than 14.5V usually means the reg/rec is broken and needs replacing. If this is the culprit it usually feels very hot to the touch, and the battery also gets very hot and may even boil over and swell up! There is also a good chance of damaging other components such as the CDI. If it reads less than around 14V, or the voltage doesn’t change with and without the engine running, then suspect that something is wrong with the charging system (stator). This can be checked by measuring the resistance across the coils. Use a voltmeter set to measure resistance and put the probes across the yellow wires at the plug that connects to the reg/rec. Disconnect the plug first. The spec is 0.1-1.0 ohm. If it is outside these parameters you may need to replace the stator. "I just wanted to say thank for all the help. I have one question what spark plugs is needed for the big bore kit." Concerning the plugs for the 300. It's generally fine to stick with the standard BR9ECM plugs and caps, especially for street use. Spirited use may benefit from BR10ECM. Be careful if thinking of changing the standard NSR plug cap for aftermarket, or using a different (taller) plug such as BR9ES, BR9EGV etc., as this may come a little close to the front tyre under full braking. The standard plug and cap are OK if all other things are standard such as forks, wheel, tyres and what have you. NSR250 back in the day, and we've fitted them to 250's and 300's over the years until our usual supplies ran out. The NGK R7282 is used in the Honda RS250 GP bike and will also work fine in an NSR250/300. Shorter than the stock BR9ECM plug, but not as short as the R5300A. This is the plug I use our RS250's, my NSR300, and Paul's NSR300. Both these race options are quite expensive, but very good for hard riding. "Could you also please advise what spark plugs to use for the 300 big bore kit, it is for a track only bike." Concerning the big bore kit, as you probably read on the website product page, the kit is made to order and as such there is a 4 week wait for making the kit. Generally we have a kit in stock, but due to demand this year, we are selling them as fast as we can make them. The kit can use the standard plugs, however, if using for the track, then I advise you use the plugs and plug caps from the RS250 NX5. 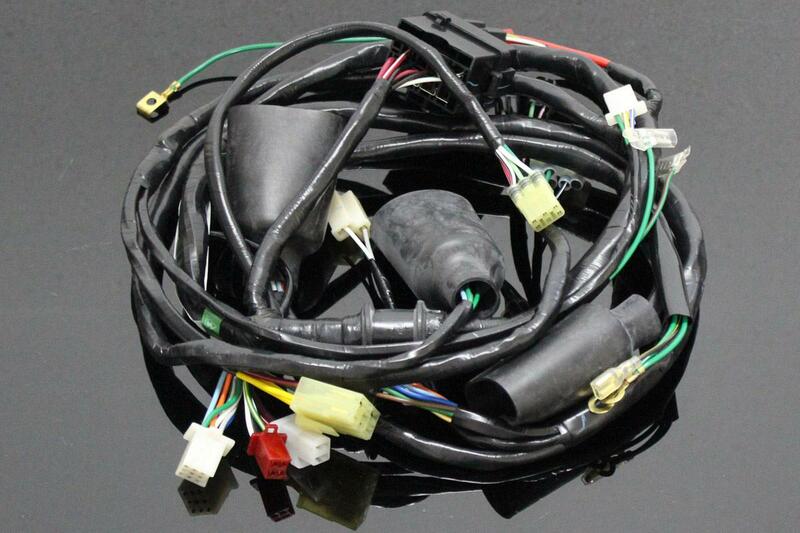 All the above plugs are suitable for the NSR250/300 for track use. They are quite expensive, but they are extremely reliable and last well. "Do you still offer a service to lighten flywheels or could i by one from you already?" We used to offer the lightened flywheel, but due to the lack of availability of good used parts, we are no longer able to offer this product. We can however lighten your flywheel for you, but that means that you'll need to send it to us, we machine it and then return to you. Sounds reasonably straight forward but as you're in the US and we're in Thailand it'll mean two lots of international shipping, a machining fee of $60, and then there's also the chance that it'll get hit for tax upon arriving in Thailand. So with all that in mind, it may work out a little pricey. To be honest, it is not a difficult job for a competent machinist. I have a tapered spigot that I true up within 0.0005” TIR (total indicated runout) in my little lathe at home. The flywheel then bolts to this in exactly the same way as it bolts to the crank in the engine. I then carefully cut the surfaces with light cuts so as not to upset the fixture at all. The most important thing is to make sure that the tip of the lathe tool has a generous radius so as not to leave any sharp internal corners as this is where cracking occurs. My lathe tool tip has a 1mm radius, which is my minimum requirement for this job. Also, it’s worth making you aware that by modifying the flywheel, the longevity of the part is reduced, and may crack eventually, so I don’t really recommend making any radical modifications for street use. But skimming 1mm off the OD, and 0.5mm off the front face does make a noticeable difference in the engine acceleration, and doesn’t make a huge difference to the longevity if done properly, as I advise above. Yep, I’ve had a couple of flywheels crack during my time racing. The crack started showing between the holes on the front side of the flywheel, so quite easy to spot during routine maintenance. "I bought a pipes jet kit lightened flywheel HRC card pistons and gaskets etc. from you a couple of years ago. I'm in Leeds. I have a problem which I wonder if you may be able to help me with. My bike is not producing a spark on either cylinder. My mechanic has had an auto electrician look at it and they have recommenced we try changing the flywheel as the first stage of elimination and then the coil pick ups. They would however be surprised if it is the coils as it is rare apparently for them both to go at the same time. One barrier to correct diagnosis of the problem is that they have no wiring diagram to use. Do you have a diagram for the ignition? or do you have any suggestions for a next step. The weather is great here, best spring ever and I am sad getting depressed not riding. hoping you can help." A little more info would be helpful if possible. Has it been running OK up until now? It's doubtful that it's the flywheel causing the problem (although not impossible), and as you rightly say, it's very unlikely that both pickups or coils would fail simultaneously. 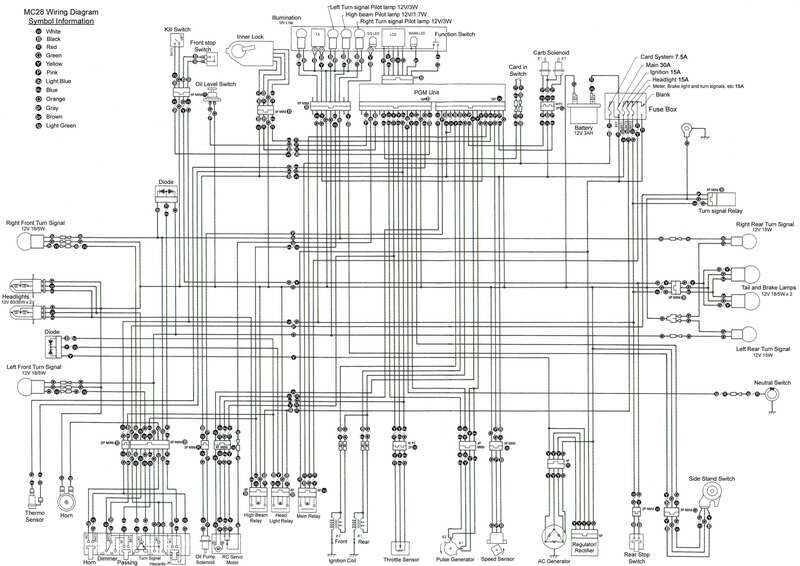 I've attached the MC28 wire diagram. Check and clean all connections thoroughly. Check your earth points, and make sure that the battery is fully charged and in good condition. The MC28 starts to misbehave if the battery voltage drops below about 12.4V. "The PGM IV is damaged :( I checked this with another PGM and the RC valve operation is fine. Can the PGM be repaired? Is it possible to actually run this PGM with the HRC card in a racing scenario where the RC valves could be done away with anyway? I.e. does the error 2 affect the ignition characteristics of the HRC PGM?" First thing to worry about before fitting a new PGMIV is why it blew in the first place. The usual story is that the is a build up of goo in the RC valve chamber, and the valve is unable to open fully. This causes resistance and simply burns out the components inside the PGMIV. Another frequent problem is overly tight RC valve cables. There should be at least 1mm of free play in the cables. Unfortunately, we have had no success with repairing the PGMIV unit. Even the PGMIII unit is a 50/50 deal with repair! So unfortunately we cannot consider an attempt at repair. Concerning the error 2. To my knowledge, this doesn't affect the ignition timing, but your best bet is to turn the servo to the fully open position and leave it there. The TPS and rpm controls the ignition timing. "I've got myself a bog standard NSR250R MC18 of 1988 vintage. Lovely. What I need is a bit more go from the 6000km engine - I will be unplugging the bullet connector as described to allow the RC valves to operate fully. Can you confirm how to do it again?" Here's confirmation about the wire to disconnect. Remove the seat unit, and look to the rear end of the bike. Hidden in the rubber boot that keeps all the indicator and rear light connectors lurks a Bl/Bu wire, with a black rubber covered bullet connector. Pull this apart and insulate as necessary. "I have an MC28 which I have raced for about 5 seasons now, At the start of this year the bike started playing up. It starts and runs fine then after about 2 miles or so it seems to go onto one cylinder. The bike is fitted with a HRC 010 card and a HRC wiring loom (This was fitted it an attempt to fix the problem, it didn't seem to make any difference). Lots of parts have been changed (coils, plugs, battery) but none seem to help, we even tried lifting the filler cap in case the fuel was not flowing. Whilst at standstill the bike runs smoothly, but when it is under load that's when the problems start. Do you think it could be the PGM unit breaking down, my ex sponsor says it sounds like a CDI is breaking down. If I had to replace the PGM unit can you supply them and how much are they. If so can a new PGM be programmed to enable me to use the HRC card. Any help you could offer would be appreciated." Bit of a tricky one this. Is it always the same cylinder that dies? I've seen this problem a couple of times and it's been down to the coil connection. The connector gets dirty and although it seems to run fine on the stand, as soon as things get up to temperature it start missing and then loses a cylinder. Take a very close up look at the coil connections. Do they look like there's any burning on them, where the electric's been 'jumping'? Just to be on the safe side, throw some new connectors onto the harness side, and give the coil connections a clean up with some emery cloth. Check all connections to be sure that they're clean and secure. You may also want to have a look at the carbs. Is one of the floats sticking? How's the condition of the engine? when was it last overhauled? Not much help I know, but just trying to eliminate a few things first. "I get a warning light and an error 3 flashing up. Why?" The 'Error 3' warning is associated with the throttle position sensor (TPS) being out of adjustment. To fix this you'll need to loosen off the TPS locking plate screw (requires special Torx key, or small locking pliers) and with a closed throttle and the power ON, turn the TPS slowly in an anti-clockwise direction (looking from the R/H side) until the warning lamp goes out. Not the most scientific way to adjust it, but it's a quick and simple fix.